With Easter and National Jelly Bean Day fast approaching, you can bet Jelly Bean sales will be soon soaring. With over 200 flavors of jelly beans out there in the wild, we went out to find which are the best ones in each state and the whole country. Here’s what we found. The jelly bean stars are aligning this year. Easter and National Jelly Bean Day are back to back on April 21st and 22nd, creating the perfect storm for a jelly bean supernova. On a normal year, over 16 billion beans are made just for the Easter season. They may need to work overtime this year. Blueberry bean lovers can thank Ronald Reagan. Jelly Belly needed a blue jelly bean when he was elected, and the blueberry jelly bean was born. 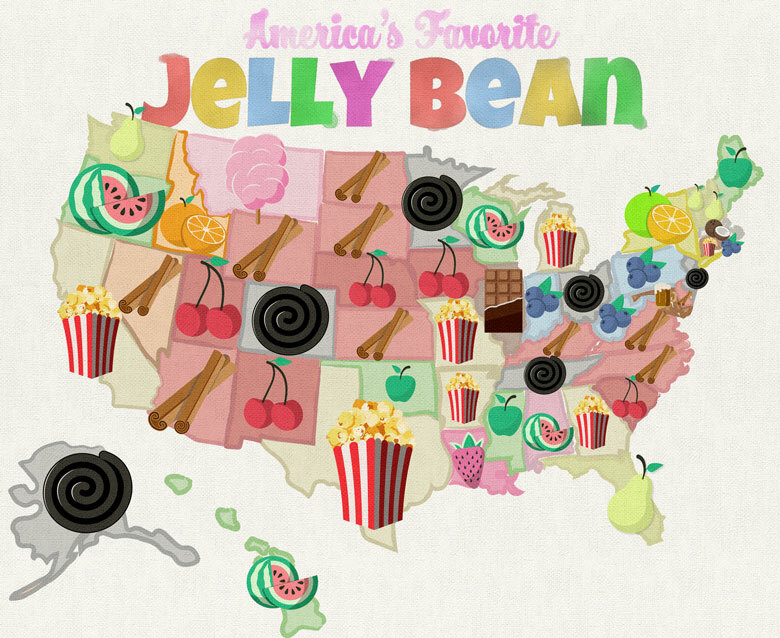 Looking at over 11 years of candy sales data and the results from over 12,000 survey responses, we were able to map out jelly bean flavor preferences by state. 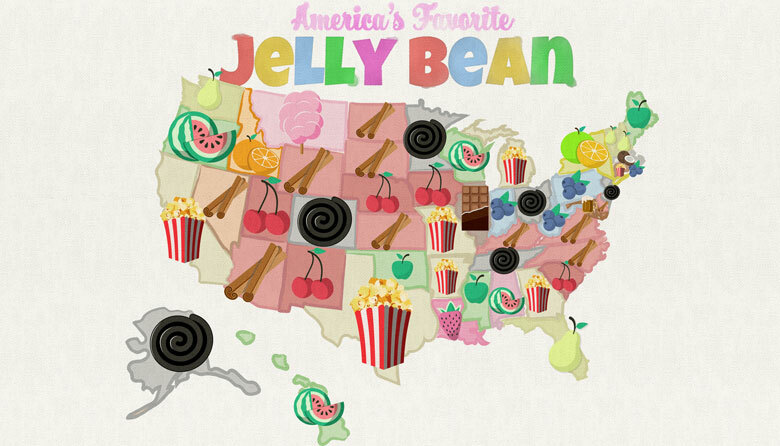 The interactive map above illustrates each states favorite jelly bean flavor. Hover over a state to reveal the top 3 most popular in that state. The results are not specific to any one brand of jelly bean. The overall nationwide results are as follows. As a nation, sometimes it seems like we can’t agree on anything. Our size, diversity and multitude of culturally-influenced preferences creates a rainbow of opinions. This particular rainbow happens to be made of jelly bean opinions. 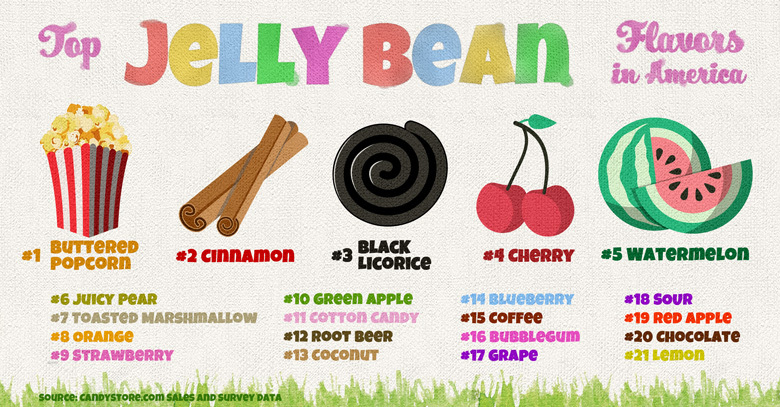 We ranked the top 21 jelly bean flavors in America. Here we go. There was a new king in town last year when Buttered Popcorn took over the top spot from Black Licorice. Both flavors incite strong opinions, positive and negative, but in the end, Buttered Popcorn remains the number one jelly bean flavor in America. It’s salty, it’s buttery, it’s the king of jelly bean flavors in America. Cinnamon is coming on strong this year. Up from the #3 spot last year, this spicy red jelly bean flavor is part of a trend of spicy candy we’ve noticed. Things have sure been heating up for Cinnamon jelly beans. Sour candy, spicy candy, savory candy are all becoming more and more popular. In fact, the top 3 jelly bean flavors do not include a sweet or fruity flavor at all. While Buttered Popcorn retained its top spot, Black Licorice is on a losing streak. It was the number one jelly bean flavor two years ago. Then it fell to runner-up last year, and now it’s just trying to stay on the podium. Still, the number three spot is very near the top and there’s no denying the immense popularity of black licorice jelly beans. They are polarizing to be sure, but enough people still love them to push them above what was traditionally the top jelly bean flavor in the western hemisphere: cherry. Cherry is like the jelly bean elder. It has been around for a long time and was once the king of jelly bean flavors, reigning for more than 20 years. It’s no longer in the top 3, but perhaps its time has not yet come. Cherry was #5 last year and has moved up to the 4 spot this year, knocking Watermelon down a spot to 5. Moving up the charts is impressive for a sweet fruity flavor in this new savory/spicy world we live in. Only time will tell if Cherry can reclaim a place on the podium, or fall back into the fray of other fruity flavors. Watermelon fell one spot to number 5 this year. They are popular coast to coast, and were mostly the victim of several other flavors moving up in their respective states. Juicy Pear is sort of a new classic jelly bean flavor. It has reached a high level of popularity in a relatively short lifespan. This year it even took over as the #1 flavor in Florida! Toasted Marshmallow moved up 2 spots form #9 last year. The toasty flavor warms the heart and the belly. It’s a great flavor to compliment other flavors and cut through some of the super sweet fruity flavors with a more creamy and slightly savory taste. Orange flavor fell a spot this year after getting jumped by Toasted Marshmallow. Orange has held strong as a classic jelly bean flavor to remain solidly in the top ten. It even took the top spot in Idaho! Strawberry jelly beans are coming on strong. They jumped 2 spots from #11 and are now officially a Top Ten jelly bean. A Green Apple jelly bean a day keeps the doctor away. Probably not, but Green Apple is reeling now after dropping 2 spots from #8 last year. A classic old school jelly bean flavor, Green Apple can still hold its head high as a top ten flavor. Cotton Candy may not be top ten, but it’s knocking on the door. Moving up one spot this year from #12, this fair ground-inspired flavor is all sweetness without the fruity. For some people it’s the perfect combination of sweet and no citrus. But not for enough people to get it into the top ten. Yet. If Cotton Candy hopes to advance, it’s going to have to fend off Root Beer from behind. Root Beer moved up 3 spots this year to number twelve. That’s a big move for a classic flavor and could be another signal that non-fruity flavors are headed for a recession. On the other hand, non-fruity flavor Coconut is moving in the other direction. Coconut was a top ten flavor last year and dropped all the way back to #13. Blueberry jelly beans, the flavor they invented specifically to make the blue in red white and blue, has fallen one spot to #14. Useful for their blue color, which is a popular color for event candy, blueberry jelly beans may struggle to differentiate themselves from the crowd of fruity flavored jelly beans. Coffee moved up 2 spots from #17 last year. Coffee, the drink, has never been more popular, and coffee flavored treats and gifts are on the rise. Coffee flavored jelly beans are no different, making strong moves and mixing it up with various flavor varieties like latte and espresso (which we lumped together). Bubblegum flavor fell 2 spots from #14 last year. Similar in color and flavor to Cotton Candy, it’s moving in the opposite direction. Could there be a zero sum game between them? Grape moved up a spot from #18 this year. Purple is a strong color and is an asset to Grape jelly beans. Purple is one of the most popular candy colors and there are not many other purple flavors. Sour flavored jelly beans have made a big splash this year, crashing onto the scene from no where to be the #18 most popular flavor. They were #1 in New York! It’s no secret that New Yorkers love sour candy. Red Apple moved up one spot from #20. Red apple has done well to stay high even though its greener brother is the more famous of the apple flavors. Chocolate jelly beans moved up one spot from #21. Chocolate lovers might not be rejoicing at such a minor move, but they did claim the #1 spot in Illinois again! Lemon flavored jelly beans dropped one spot to #21. The advancement of Sour flavored jelly beans has probably knocked them a little. But lemon is a classic flavor that we do not expect to fall too far.